We’re supposed to be getting many days of chilly rain this week and that’s a good thing, we need it. 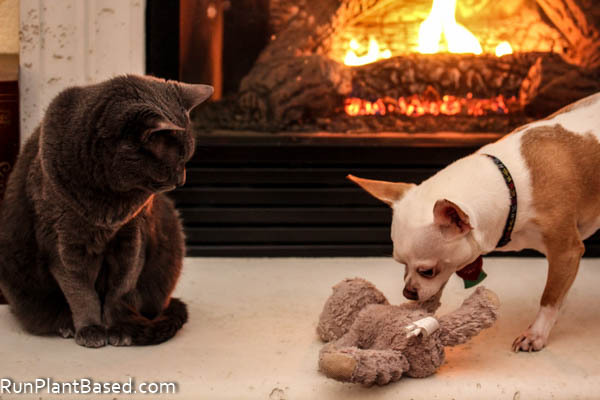 Except sharing the warm fireplace isn’t always easy, Smokey gets a little cranky when Miko gets in the way of her favorite show. And Miko likes to lay his toys out at the fireplace to warm them up. 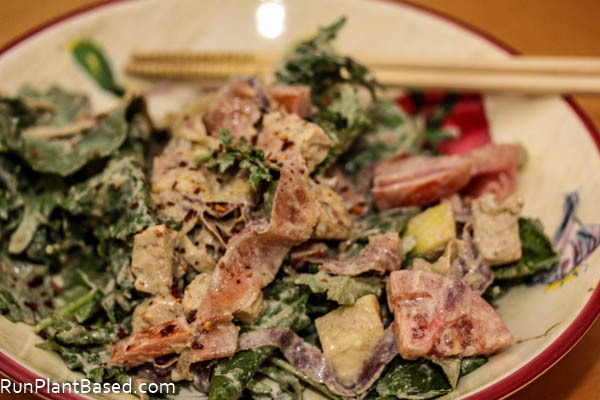 This may be a cool salad, but the kicky ginger flavor in the dressing will warm you up. This savory and sweet dressing has a simple list of ingredients without oil or sugar, fresh ginger, and a thick and rich texture perfect for a hearty winter salad. 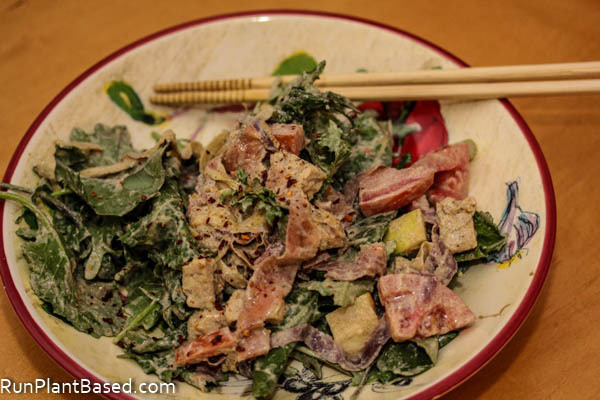 I coated a salad of chopped tempeh, kale, apple, carrots, and tomato for an interesting combo. And topped with Trader Joe’s smokey seasoning blend, yum. The texture is silky and smooth, slightly gooey, and it coated this hearty meal salad nicely with a sweet and savory ginger and onion. Perfect way to add vibrant color and fresh ingredients to a gray winter day. Excited about the ginger flavor in this salad! Yum yum. And the medjool dates, I still need to stack up on those. Looks like a delicious dressing that will keep those salads going down! Cut pet photo’s as always!!! Hahaha! Miko is so cute. My little ones are so stir crazy. It’s been way too cold to walk them this week and they are restless. Coco keeps getting into all kinds of mischief. Love the sound of this dressing. Ginger and dates with tamari sounds delicious. Mine too, we’re supposed to get a few days straight of rain and wind and they won’t even go onto the covered patio in the weather! Thanks! It has a really great texture too! Oh no, sorry about hemp seeds! 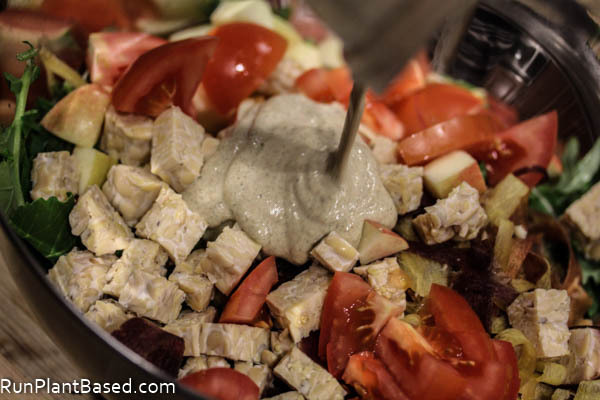 They are great, but you could use sunflower seeds in their place for this dressing.